VILSECK, Germany – U.S. Army Medical Department Activity Bavaria (MEDDAC Bavaria) celebrated Native American Indian Heritage Month, here, Nov. 20 at the Multi-Purpose Center on Rose Barracks with cultural dance, song, and games. Col. Mark Swofford, Commander, MEDDAC Bavaria, opened with remarks reflecting on the history of Native Americans in the Army. “Throughout the Army’s history, Native Americans have served valiantly and with distinction in times of peace and war, while fighting for the right to be an equal part of our Nation. Today we recognize and celebrate the accomplishments of this country’s original inhabitants, explorers and settlers. Native Americans have a distinguished legacy of service in the Army,” said Swofford. Swofford was followed by students from Vilseck Elementary who warmed the crowd’s hearts by reading a selection of poems paying homage to Native American Indian heritage. Guest speaker Sgt. 1st Class Jason World Turner, Equal Opportunity Advisor to Regional Health Command Europe, and a native of Lakota, Dakota, and Nakota Sioux, spoke on why supporting cultural awareness is significant. “These observances are important because it allows us to bring awareness and educate others in our cultural differences. It helps bridge the gap and allows us to share a little bit of our history for those who aren’t familiar with it,” said World Turner. Following his remarks, World Turner taught onlookers a childhood game called “The hand game” and shared its meaning. “The hand game was a way for people to settle disputes. If there was a dispute over land or anything, two chiefs would agree to play the game to settle their differences” explained World Turner. Mr. Kendell Grant Old Elk, a guest of MEDDAC Bavaria, honored the audience with an historic ritual to pay tribute to fallen warriors and veterans. “The song and dance is to honor those warriors and veterans for their bravery. It’s how my people showed their appreciation for those good men and women,” said Old Elk. November is National Native American Heritage Month, honoring American Indians and Alaska Natives. This year’s theme: Sovereignty, trust and resilience, demonstrate how American Indians and Alaska Natives have profoundly shaped the character and cultural heritage of the nation. 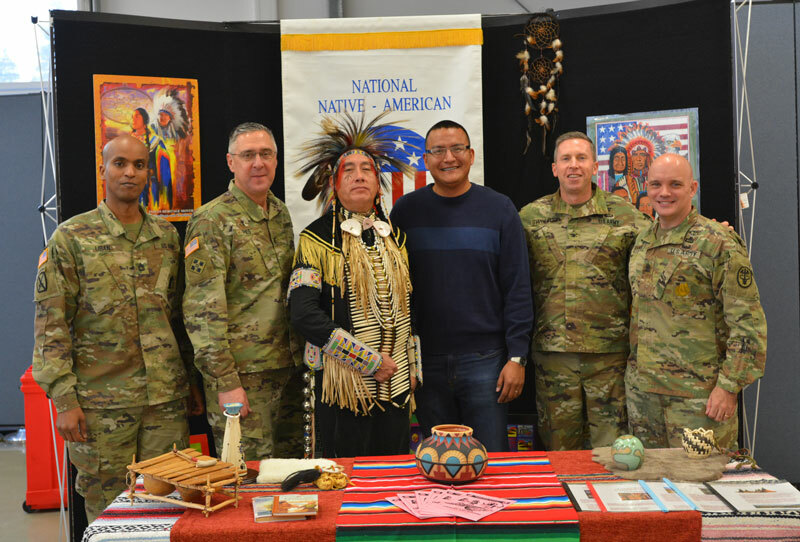 During Native American Heritage Month, United States Army Garrison Bavaria encourages all Soldiers and community members’ to recognize and express appreciation for the past and present contributions of Native American Soldiers, Veterans, civilians and Family members.